It’s that time of year. No, not the Christmas music I’m already hearing. It’s time to prep for Thanksgiving! But as a very proud American who is also an old-world wine lover and avowed Francophile, I feel very strongly that that this holiday should be celebrated with American wines. And my suggestions will continue to reflect that! Something that hasn’t changed: with a) a large group of people and palates to please, and b) a series of dishes that vary wildly in flavor, texture, and temperature, I still like the idea of no less than four wines: a lighter white wine, a serious white, a delicate red, and a full-bodied red. Viognier: In the past, I used Riesling as my go-to here. But Sue & Rodney Tipton at Acquiesce Winery make such a delightful Viognier- it’s a gently flavored white wine that will please any palate, and this is ideal for the non-drinker or the delicate flower in your group. For $26/bottle, I find this a massive bargain, and a great wine to start the meal with. 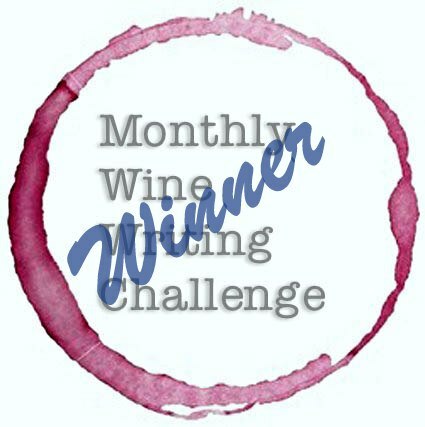 Chardonnay: I’ve narrowed it down to two possible bottles in my cellar: Harney Lane’s 2017 Chardonnay from Lodi, or DuMOL’s 2016 Russian River Valley. The Harney Lane is a beautiful expression of the grape and a wonderful California chardonnay with an ideal balance of oak- not too much, nor too little- making a creamy and flavorful balance, savory with perfect fruit and acidity, with a SRP of $28. And California’s DuMOL might tell your mouth you’re knocking back a very pricey white Burgundy! It’s soft, balanced, simply gorgeous– and a little on the high side (over $50/bottle). The downside is you have to join a waitlist to buy direct, but their wines are available at Wine.com, Wine Library.com, Sokolin.com, and many other online retailers that ship across the USA, and even some local high end retailers who carry the best of California wines. Totally worth the weight. And if we bounce through one of these bottles, I’ll open the other. No problem! a) Still Rosé: Leah Jorgensen Rosé of Cabernet Franc. When I pour this $22 bottle, people lose themselves in ecstasy. I don’t know what she’s putting in the bottle beyond the grape juice, but the wine simply sings of pure fruit, delightful acidity, and beauty. Leah is a brilliant winemaker that you should be aware of, period! b) Sparkling Rosé: The time I spent in Yakima recently certainly influenced this year’s Thanksgiving choices! I’ll be serving an $18 bottle of sparkling rosé from Treveri Cellars. The Treveri Sparkling rosé you can buy online is made of syrah and chardonnay and is a real crowd-pleaser, while my personal favorite is their tasting room rosé, which is only available in person at the tasting room. This is half pinot noir and half chardonnay and has an old-world charm that sings to me. Sparkling Shiraz: The pièce de résistance this year might be this wine! Treveri Cellars also makes a $20 sparkling shiraz that has such vibrant notes of cranberry, I immediately knew I had to serve this for Thanksgiving! My gut is that it’s going to be a smashing success. But I’ve not actually tried this wine with a savory meal yet- so I’ll make sure to report back with my annual Thanksgiving Postmortem and let you know what my guests thought of this choice- and the others! I am SO excited to hear what my guests think of this wine with the main meal! Cabernet Franc, for my annual ‘delicate red’ wine. Traditionally it would be a pinot noir -and there are plenty to choose from from the USA- for this old world Burgundy fan. But I’ve been absolutely blown away by the beauty of balance of the cabernet franc from Owen Roe winery. So I have one bottle of $28 Owen Roe’s Rosa Mystica, a wine that totally wrecked me -in a good way- and I plan on putting this on my Thanksgiving Table. This Yakima Valley red is really gorgeous and drinks like an old-world red – I simply can’t wait to try the pairing with turkey and gravy! Zinfandel: I have two bottles I am going to decide between: a rare and hard to gain Turley, of which I have ONE bottle (and it’s a hoarder bottle I’m loath to open) and my favorite Zin on the planet, Lizzy James OVZ again from Lodi’s Harney Lane. I could almost as easily choose their standard Zin, the Scottsboro Zin, or even their Syrah- but I am just in love with the gnarly, curled old vines and the magical fruit they produce. The wine is big, bold, yet refined and polarizing. Any time I have opened a bottle of the $36 Lizzy James, it has changed lives at the table. It’s a small price to pay, that’s all I’m saying. So- let me know what you think about my picks, and what you plan to open for your Thanksgiving this year! The 2015 Adler Fels (German for “Eagle Rock”) is a blend of two chardonnays, equal parts from vineyards in Russian River Valley and Monterey County by winemaker Linda Trotta. Color is medium straw. The nose offers pineapple and wildflowers. Gentle but fresh and lively in the mouth, presenting a balance of delicate fruit and taut acidity. Moderate body for the mouthfeel; nicely tart across the mid-palate with notes of chalk, clay, and cedar plank to accompany the medium finish. This is a subtle wine, capable many things. It can be a demure, delicate delight on its own, an accompaniment to a meal, or act as a supporting player to a dish without taking the spotlight. It took me three separate tastings to really understand that this wine is a modern, classically refined New World chardonnay from the European tradition. Instead of screaming for attention, this unpretentious wine is strong and silent, with measured structure and exquisite balance. I would equate it to Chanel perfume or the Jaguar XJ6 automobile, whose motor purrs so gently, you hardly feel the speed at which you rocket down the road. This is a wine you easily could drink all afternoon without realizing you have loved it for two or three bottles, and that it is time to call a car (leaving your own behind) and go home now before you order another. And another. Hahn Winery 2012 Chardonnay– Monterey, California. MSRP $14/bottle; 14.5% ABV. 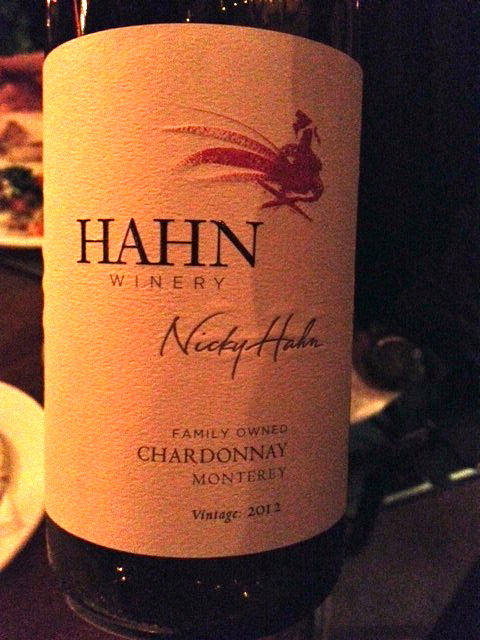 While in Los Angeles on business, I met friends in Pasadena for dinner and found the Hahn Chardonnay on the wine list. I brought it up when discussing wine options to find it was highly recommended by the server as a great choice for our food selections so no further discussion was required! Color in a dimly lit room was light straw, with an aromatic, citrusy nose. In the mouth, the flavors of green apple, lemon zest, and crisp bosc pear are complemented by a nice tight acidity. This combination was able to stand up beautifully to mexican spices, and paired beautifully with fresh guacamole, grilled vegetables, and fish entrees we enjoyed for dinner, leaving the mouth fresh and ready for the next bite.I was very pleasantly surprised by this wine with the focused fruit flavor, direct delivery to the front palate, expansion on the secondary palate, and vanilla spice finish with a hint of minerality. While it is not for those who want an old-school-California buttery chardonnay, instead this wine shows lots of European chablis and sauvignon blanc attitude without the characteristic aromas. Kudos to the winemaker! A fun white at a very reasonable price, this is an easy add to your repertoire and a crowd pleaser and makes me want to taste more of the Hahn Winery offerings.